From this we can get a basic definition of geothermal: “of, relating to, or caused by the heat of the earth.” Geothermal heat pump systems are one way to use this heat. Also referred to as ground (may be earth or ground water) source heat pumps or earth-energy systems (ESS), geothermal heat pumps use a system of equipment and piping to transfer heat from the earth to an occupied space in the winter and from an occupied space to the earth in the summer. What is a heat pump? Heat naturally flows from warmer substances to cooler substances. For example, if you have a glass full of ice and put it on the table, the ice will melt if the room temperature is above 32 degrees Fahrenheit. What is actually happening is the heat from the room is flowing to the ice in the glass, raising its temperature. Left alone, both the ice and the room would find equilibrium. A heat pump reverses this, causing heat to flow from cooler temperatures to warmer temperatures. Geothermal heat pumps act just like air to air heat pumps, but because the temperature differences are much more tempered, the energy required to operate the system is much less. Heat from the earth can also be used to heat domestic water to 125 degrees.In the winter, geothermal heat pump systems remove heat from the earth through a liquid, such as ground water, antifreeze solutions, or refrigerants. This heat is then transferred to the indoor air via a heat pump. During summer months, this process is reversed; heat is extracted from the indoor air and transferred to the earth through ground water or an antifreeze solution. A direct-expansion (DX) system uses refrigerant in the ground-heat exchange instead of an antifreeze solution. 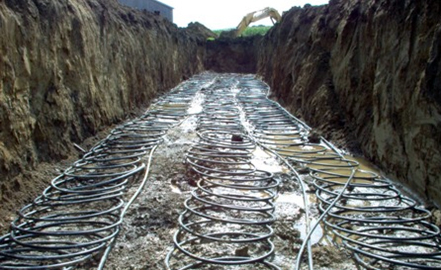 Geothermal heat pump systems are available for use in both forced-air and hydronic heating systems. They can also be designed and installed to provide heating only, heating with "passive" cooling, or heating with "active" cooling. Heating only systems do not provide cooling. Passive cooling systems provide cooling by pumping cool water or antifreeze through the system without using the heat pump to assist in the process. Active cooling systems use the heat pump. In the summer (cooling mode), heat is rejected from the inside of the space, 70 degrees for this example, to the earth, which has a constant temperature of 55 degrees. In this situation, instead of requiring a heat pump to force heat from a cooler to a warmer area, there is a natural flow of heat from the warmer 70 degrees to the cooler 55 degrees. Normally, this process does not require the assistance of a heat pump. Then, in the winter (heating mode), heat must be extracted from the constant 55 degree earth and discharged to the space being maintained at 70 degrees. Since 55 degrees is well above the 45 degree limitation of heat pumps, one can readily see the savings. Unlike in air source heat pumps, which are commonly found in many homes today, strip electric heat is not required. With an air source heat pump, in the summer (cooling mode), heat is rejected from the inside of the space, 70 degrees for this example, to the ambient outside air temperature of 95 degrees. This rejection of heat from a cooler substance to a warmer substance requires a heat pump to reverse the natural flow of heat. In the winter (heating mode), heat is removed from the ambient outside air temperature of 0 degrees and delivered to the inside space which is being maintained at 70 degrees. Because this also reverses the natural flow of heat, a heat pump is required. Unfortunately, since the difference in indoor temperature and outdoor temperature is so great, a heat pump alone cannot perform the task. Because of this, back up heat needs to be provided, usually in the form of electric strip heat. It is wired so that the electric strip heat is energized whenever the outside air temperature drops below 45 degrees. Another way to look at this is to say that if the outside air temperature is below 45 degrees, air source heat pumps are not efficient. For this reason, air source heat pumps are not usually recommended for use in the colder climates in the northern United States and Canada. Although an electric company may offer rebates for installing an air source heat pump, that will probably be the only savings you as the homeowner will incur. One can easily see why geothermal is so attractive and where the energy savings come from. Also, because there is no equipment outside, maintenance can easily be scheduled year round. Another savings is that the equipment is no longer exposed to the extremes of winter and summer. 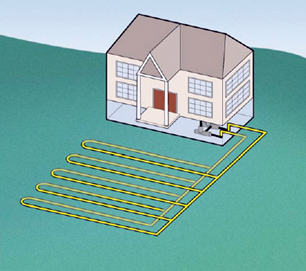 Geothermal heat pump systems have indoor components and an outdoor heat exchanger. The heat exchanger will be one of two types: a closed loop system or an open loop system. In a closed loop system, all the fluid which leaves the building to go through the heat exchanger will be delivered back to the building after it finishes its loop. 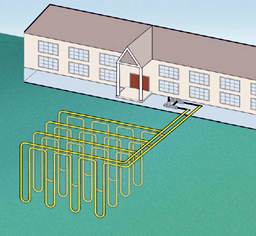 In an open loop system, water is pumped out of a well or wells and sent into the building to exchange its heat. Then, it is pumped back out and discharged in the same body of water out of which it was originally pumped. Vertical borehole well fields may be used for the open loop system. Of the closed loop systems, there are three different heat exchanger loop orientations, all of which are buried. 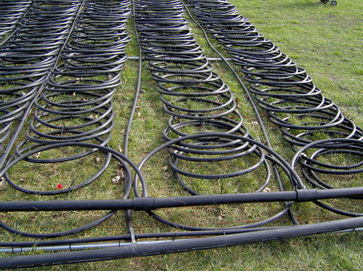 Closed loop horizontal ground heat exchangers are buried at a depth of 5’-0” to 8’-0” on average. At this depth the temperature of the earth is nearly a consistent 55 degrees and is not affected by climate and weather conditions. The exterior piping is installed in horizontal runs and needs to be very long in order to exchange the amount of heat required. Once the exchanger is buried, water or another refrigerant is circulated through the loop. One of the ways to limit the of length horizontal trenches used to contain the heat exchanger is to use a product resembling a “Slinky.” They were invented to bury miles of piping in a limited space. 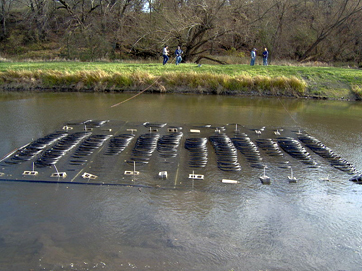 Another style of heat exchanger used can be buried in a nearby pond or lake. Again, the “Slinky” style piping may be used to minimize the length of piping which must be buried. Because the piping is buoyant and full of air, it is first filled, and then concrete blocks are used to sink the heat exchanger to the bottom of the pond or lake. Borehole heat exchangers (BHE), also referred to as down hole heat exchangers (DHE), are used where land area is limited. For example, they can be located under a parking lot or even under the building itself. With this type of system, vertical holes are bored down into the earth in a pattern. Then, piping loops are inserted into the bored holes and connected by a manifold at the top. The reader would want to avoid locating the boreholes under the building because of the difficulty in servicing the equipment. Although borehole heat exchangers have a life expectancy of 50 to 75 years, no one knows what kind of service could be required, as the systems have not been installed for that length of time anywhere. Borehole heat exchangers can also be used in open loop systems. Geothermal heat pump systems cost around $2,500 per ton of capacity. For example, if a typical home uses a three-ton unit, then the geothermal heat pump would cost around $7,500, almost double that of a typical heat pump system. You also have to take into consideration the cost of drilling, trenching, and installing well loops, headers, or piping, depending on the type of system. On average, the cost of drilling can run from $10,000 to $30,000, depending on the terrain and soils constituents. But an efficient geothermal system saves enough on utility bills that the investment can be recouped in five to ten years. Little maintenance is required for geothermal heat pump systems, as they are relatively durable when compared to normal heat pump systems where the condensing unit is outside. They have fewer mechanical components than other systems, and most of those components are underground or indoors, sheltered from the weather. The underground piping used in the system is often guaranteed to last 25 to 50 years or more, and is virtually worry-free. The components inside are small and easily accessible for maintenance. Just as with a regular forced-air system, warm and cool air is distributed through ductwork to the rooms. Also, because there is no outside condensing unit like air conditioning systems or normal heat pumps have, geothermal systems are much quieter.